Bothan na' Tilleadh is in the hamlet of Polbain (The White Pool or Pond) overlooking the Summer Isles on the Coigach Peninsula some twenty-five miles (40 kilometers) to the north-west of Ullapool in Wester Ross in the North-West of Scotland. The area is remote, but then that is its charm. It is beautiful, summer and winter. Bothan na' Tilleadh is the smaller on a half-acre of land we have recently purchased. The main house, Tigh na' Tilleadh, was the crofter's cottage and Bothan na ' Tilleadh was originally the byre. Well converted, comfortably furnished and newly decorated the Bothan consists of a hallway, one bedroom, a shower room and an open-plan kitchen, dining area and living room. The house is reached by steps from above through a gate onto the road opposite Polbain Stores. It has mains electricity, its own spring supplying water, full electric central heating and cooking, as is usual in the area, is done by calor gas. All electricity, water and gas are included in the cost of rental. We have to make sure that the bothan is to as high a standard and as well equipped as our own. It is suitable for two adults or two adults and up to two children and at a little more of a stretch, four adults. The bedroom is designed for two, either in a king-sized bed or two singles. The bases of the two single beds merely lock together to form the king-size and the mattresses zip together. King-sized sheets, duvets and duvet covers plus pillows and pillow slips are supplied and again included in the cost of rental. A cot and a fold-down single bed are also available on request. This is a shower room and not a bathroom. There is no bath. The shower is, however, very good with excellent pressure. The water is heated by an immersion heater. 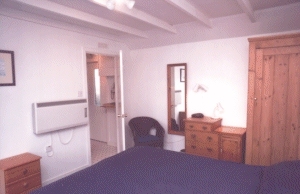 The room is heated by an electrical fire and there is also an heated towel-rail. We believe the kitchen is fully equipped for up to 4 people. As well as the calor gas stove we have also installed a washer-dryer, a dishwasher, plus toaster, kettle, coffee maker and microwave. There is a large refrigerator and freezer. The dining area is again designed for four with an extension flap on the dining table for additional guests. It is on the same level as the kitchen between it and the sitting area. However, because the sitting area is below the the level of the kitchen there are direct views through the picture window across the sound to Tanera Mor. For babies there is a high-chair available, which can be turned into a toddler's chair and table. The living room is down three steps from the dining area. The south-facing wall is almost entirely window with superb views across the paddock and down to the Summer Isles. It has an armchair and a folding settee that sleeps up to two additional people. There is a television with Freesat. There is also a stereo, with a CD player and tape recorder. By the main house there is a large patio with wooden garden-furniture. There is also a small, walled, sheltered one to the front and right of the bothan. There is a small lawn in front of the main house and to the right of the bothan, where there is a large childrens' climbing frame. Much of the rest of the garden is left semi-wild and the paddock is left completely wild. We have, especially in summer, a wide variety of bird life including hawks, and a remarkable variety of butterflies and moths. To encourage them we leave as much of their potential habitat a possible. The midge can be the scourge of The Highlands but we, because we are close to the sea, have little problem except some evenings at dusk. Hot water in the bothan is by immersion heater and the bathroom has its own electrical heater. Heating in the other rooms is by electric wall-heaters. There is one in hallway, one in the bedroom, one in the kitchen-dining area and two in the living room. Each can be turned on and off at the mains independently and can be adjusted by using the timers, the boost switches and the programmers. As people who have lived in Southern Europe and even in the Tropics at various times we have over-specified that the heating to ensure we, our family and all our guests remain warm and dry even in the depths of winter. All the costs of heating and hot water are included in the rental. Beds are all made to your specification on your arrival. We can offer double and single beds. All bed-linen, bath-, face- and tea-towels are always included in the rental and are changed at least weekly . If the dates you are looking for are available here are the prices and the seasons but read this note first. All bookings in high- and mid-season are normally taken only from Saturday to Saturday. In the case of long bookings, i.e., over 2 weeks, we can be flexible. That may mean at times that there will also be gaps that can be filled in. Please carefully check the available dates above, if you are looking for a shorter break. Non-standard, high-season bookings are all charged on a pro-rata basis. In mid-season over Christmas, New Year and Easter we are happy to accept arrivals and departures on other days other than Saturday. We also accept stays longer or shorter than a week. Stays longer than a week are then calculated on a pro-rata basis. Stays shorter than a week are calculated at basic rate of &pound;33 per day, plus the daily rate for any other applicable supplements. In low season we are happy to accept bookings of duration of two days or more, arriving and departing on any day. We then charge a basic rate of £25 per day, plus the daily rate for any other applicable supplements. You might also be interested in some of our short-break, special offers, details of which are given immediately below. The Coigach Peninsula is ideal for leisurely cycling, as long as you do not mind a hill or two. 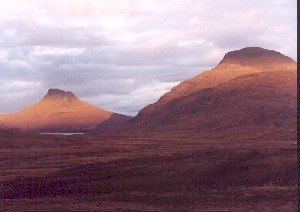 Cearcall na'Coigach (The Coigach Ring Road) in either direction offers some of the best view in the Highlands. Clockwise you have views of the Summer Isles. Anti-clockwise you have the panorama of Beinn Mor Coigach, Beinn a'Eoin, Stac Pollaidh, Cul Mor, Cul Beag Suilven and Canisp. We also now have a second property for rental, new for this season. Renovated to the same standard as the Bothan, the Tigh, is close to the Bothan. It is a larger property suitable for 2 to 7 people, with three bedrooms, a double, a twin and a single, sitting room with open fire-place, a dining room and a brand new kitchen. Below you will find details of pricing and availability. For more details still click here on Tigh. Each year at the end of June or the beginning of July the Coigach Gathering is held. On the Friday evening there is a full Ceilidh followed on Saturday from midday by the gathering itself - an afternoon of piping, dancing and fun for all ages - plus the Coigach Hill Race. Getting to us with a car is not a problem. Getting anywhere in the Highlands, when you have no car, can a problem. We appreciate that. We in Polbain have a bus that stops right at our door and that may make your holiday with us possible but we also have one further offer. We appreciate too that it is a long drive to us from the South of England and Wales and still more from Continental Europe. We are 630 miles from London and do not try to hide the fact. That is one reason we are unique in landscape and culture. We think the drive is worth it and we want you to come. Many of our guests make the journey over two days with an overnight stay on the way. Others look to fly from wherever they stay in the World and then hire a car at Inverness, Aberdeen, Edinburgh or Glasgow's airports. We understand that care-hire is not cheap. Its extra cost may make the difference between you coming to us or holidayng elsewhere. We want you to stay with us and to encourage you to do so we will at any time of the year give you a 15% reduction in all our rental prices, except our "Specials". All you have to do is provide us in advance of your final payment to us a copy of your car rental agreement and pay us by the due date by cheque, either in Sterling or Euros. Click here on Coigach to return.